The Scientific Anglers Amplitude Smooth Infinity Fly Line is an extremely versatile general-purpose taper designed for most freshwater species; an excellent line for trout, grayling, panfish, bass, carp, steelhead, salmon and pike. The Smooth Infinity Taper is built a half-size heavy to load faster, modern-action rods but to also turn over big flies. However, we have found that this line works great not only on faster rods. The extended head length allows allows for serious mends and ridiculously long casts. Coupled with the AST Plus x slickness additive, when you want this line to go, it goes. This is a fabulous line for all primary methods of fly fishing: dries, nymphs and streamers. This line is best in moderate to cold climates. Scientific Anglers Premium Smooth Lines are the combination of SA's revolutionary AST fly lines with additional slickness. These lines are smooth like traditional lines, but they have increased durability and slickness due to their new smooth coating. Each Amplitude Smooth is built with three colors for easy identification for the separate sections of the line. Welded loops provide you with easy rigging and interchanging as well. 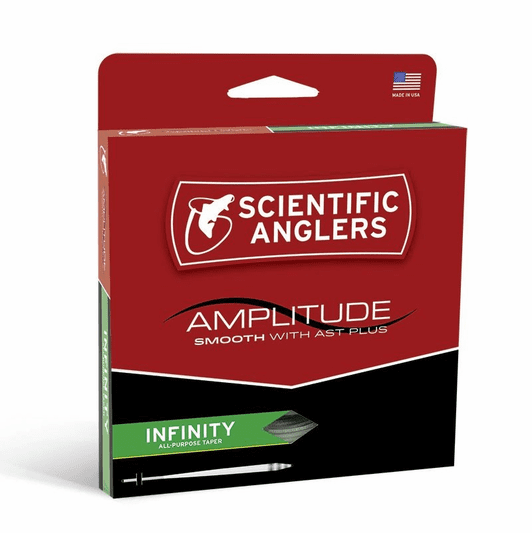 Overall, we feel that the Amplitude Smooth Fly Lines are the finest and most durable smooth-coated lines in the world for both freshwater and saltwater applications.